There is no hiding that we have been hard at work creating a front-pipe back exhaust system for the 2017+ Civic SI that is like no other. The team will not be satisfied with standard bent steel piping connected to a pair of cheap mufflers with exhaust tips sticking out that don’t quite fit the car. We are talking about a full system designed from the ground up with purpose. Our aim is a system that not only functions well but has an aggressive exhaust note that complements the car. To this aim, we got all but the tips sorted out ourselves then asked you guys for feedback in our last blog . How was the overall shape? What color should it be? Price? You guys delivered. We got tons of awesome feedback and went back to the drawing board, literally. In order to REDEFINE the Aftermarket you need to work not just a little - but a lot. You need to really step outside of the box and reimagine how to get it done and then do it. We paid careful attention to your feedback in the last blog. You said that the tips looked thin and somewhat unfinished. You felt they did not accurately display the amount of work that our team put into the design. We agree. We rebooted our tip design looking for a finish that better complimented the curves of the car, but not just the curves, the geometry too. You’ll see the CivicX has a lot of irregular hexagons all over the car, some even hidden in plain sight. You see them in the front grille, rear bumper cover, the tail lights and more. Being such a dominant shape in the design we decided to work more with the OEM lines rather then do what everyone else does and counter them. Honda put in a lot of effort into the design and we want to respect it and improve on it. 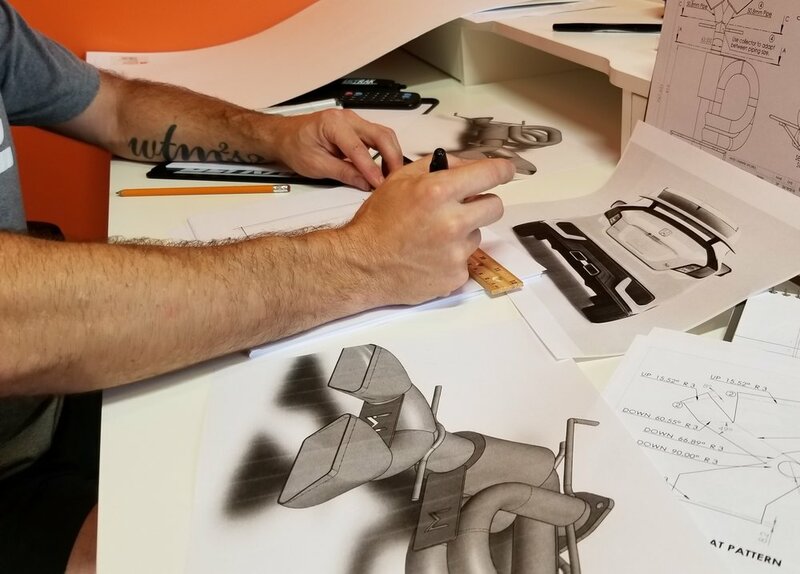 From this conceptual drawing we created a 3D rendering resulting of a brand new tip design for our SI exhaust. This design we feel truly highlights the CivicX and gives it a look the car deserves. Now we know this tip is a lot to take in. But we ask you this: stand behind your car and view your exhaust tips from different angles. Really look at it like you are checking out a very fine booty. Look at the lines and the curves, see what makes it up and what defines them then look at the design and picture it installed. What do you think? Check out the tip a little more refined from a different angle below. Again take it in and imagine it on the car. Notice the irregular hexagons cutouts? See how they work with the several already present on the car. We will soon be posting some fitted 3D Prints for you to consider before we move to functional prototypes. As last time please leave us your comments and thoughts below. Your feedback is impacting this design real-time.